The East Beach Barrier Beach is a dynamic environment that changes from season to season and year to year. This process has been studied by URI Graduate School of Oceanography researchers who have created the world's longest continuous record (33 years) to our knowledge of barrier beach profile. An example of a short term graph is shown on this linked page. This short term data is combined to form long term graphs like the one shown on this linked page. Sand volume of the beach in winter is considerably changed from that in summer, as these photos demonstrate. Now you know why at one time the terms "Winter beach" and "Summer beach" were used. Sand is normally taken away in the stormy winter months and replaced during the calmer summer months. This doesn't always happen though! Can you think of a type of storm that can hit New England during the late summer? Note the low volume of the beach during winter as opposed to the summer. Also note the low volume of the beach after major storms. There are several reasons the Blizzard of 1978 had a significant impact on the volume of sand on East Beach. One reason was erosion due to numerous storms prior to the blizzard and Hurricane Belle in 1976.Please refer to the second chart which shows how the beach took 15 years to recover its volume after the Blizzard of 78. Although East Beach and Ninigret Pond share much history. East Beach has it's own unique history because it is part of the Rhode Island shoreline. Since it is our first line of defense against storms it gets the brunt of the destructive weather. The beach changes everyday with the rise and fall of the tides. The most dramatic changes can be seen in the wake of powerful storms, such as hurricanes and northeastern storms. Great volumes of sand were eroded in a short time span during the years between 1976-1978. 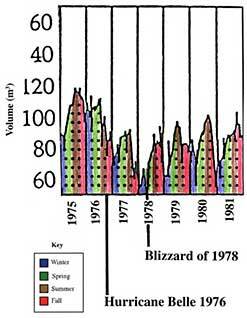 In our graph we will look at Hurricane Belle and the Blizzard of '78, which show the greatest loss in sand volume between 1964 and 1995. This is shown in the graph by a sharp falling line. The graph is divided into rectangular boxes that represent a year. The box is then divided into four areas by dotted lines to represent the four seasons. See the Changes in the Volume of Sand at East Beach from 1963-1996 . 1938: The hurricane swept over the barrier beach, cutting 7 surge channels through East Beach, washing dunes into Ninigret Salt Pond and washing at least 90 beach houses back across the pond almost to Route 1. 1951-63: Hurricane Carol (1954) caused $2.5 million worth of damage. Channel to Green Hill Pond was established in 1962 to open it to the Charlestown Breachway. 1976: Hurricane Belle made landfall in late August of 1976 on Long Island, New York. Winds and waves were powerful enough to transport enormous quantities of sand from East Beach and the dune crest retreated over 30 feet. Feb, 1978: The Blizzard of 1978 caused severe erosion of East Beach and washed sand over the dunes into several ponds. 1978: Relatively fair weather. Dune regrowth resulted in the ability for incoming residents to build oceanfront real estate.